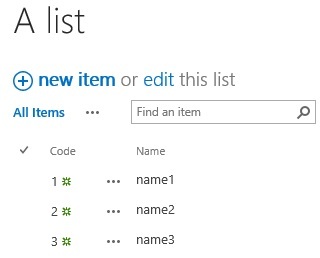 The both fields should have relationship: if I choose item code, the name changes to the name of that code and vica versa - if I choose name, the item code changes to the code of that name. Teylyn is correct - a lookup definition can't be changed on the fly. In List B, create your lookup column to List A, but use your new calculated field as the 'in this column'. You can't change the dropdown order, but if you create your calculated field correctly, being able to see the codes and names at the same time should help. You can also pull in the individual columns as additional columns if you want to see them separately on a view. This is not possible out of the box. You can create a lookup column to a different list, but you have to determine ONE key column that serves as the main lookup column. Then you can select other columns that will bring back values from other columns. But you cannot switch back and forth between different "main" columns. Not the answer you're looking for? Browse other questions tagged sharepoint-foundation lookup-column newform or ask your own question.